We use best quality ingredients to achieve deliciously rich, truffle-like treats. Try this easy to follow recipe for all star results. 1) In a bowl, thoroughly combine the currants, glacée cherries, cognac, and 8 oz of the Flapjack crumbs. Cover and leave at room temperature overnight. 2) Lightly melt the caramel in the microwave and stir into the Flapjack mixture. It should be quite moist. 3) Next, stir in the remaining 4 oz of Flapjack crumbs and chopped walnuts. Sift 1 tablespoon of cocoa powder over the entire mixture and stir until completely incorporated. 4) Using a tablespoon, portion out the entire batch. Between your palms, roll all the scoops into balls. 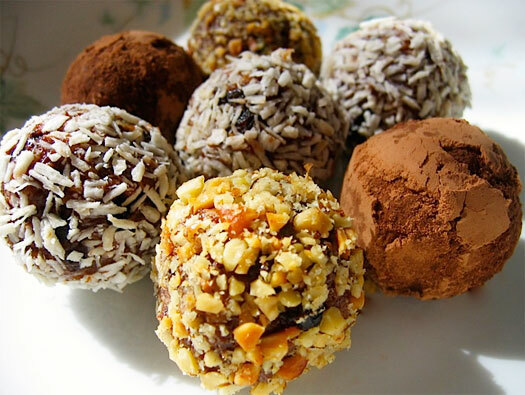 5) Finish each ball by rolling in powdered sugar, cocoa powder, chopped roasted walnuts, unsweetened shredded coconut or a combination of the coatings. These balls have quite a kick if you eat them straightaway. If you prefer, you can age them in an air-tight container overnight at room temperature for a deeper and mellower flavor. They make for great holiday treats. Serve with hot tea, coffee or a snifter of cognac! This entry was posted in Blog and tagged caramel, Flapjacks, recipes.